Text description provided by the architects. 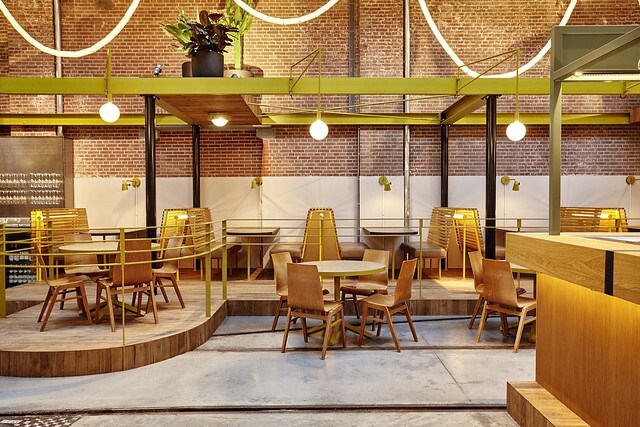 Set in De Hallen, a former tram depot in Amsterdam west, Kanarie Club pays tribute to the old trams with its renewed design. Digging deep into the history of the building, Studio Modijefsky has created a design with strong references to the past. As a tram depot there were several activities taking place in the space giving service to the run down trams, such as electricity, paint, wood and metal work. 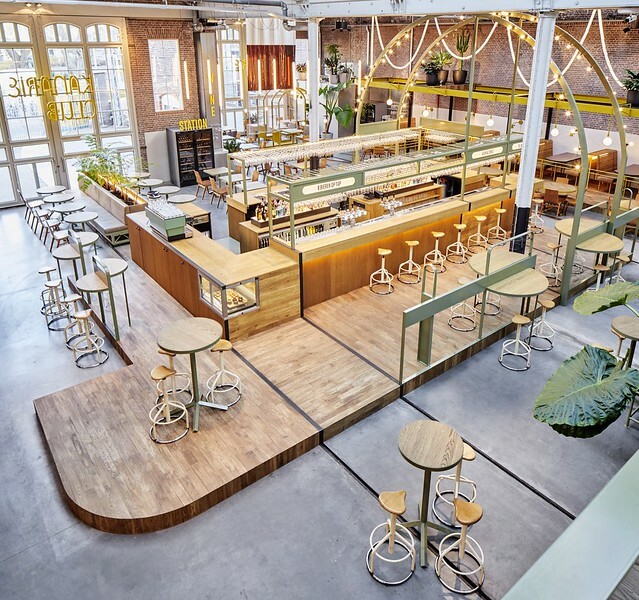 These skills and the tools and work spaces they require, inspires the material and colour palette of the new interior and are means to divide the new restaurant space into different zones. What remains today are tram rails that led the trams into the space to undergo treatment. 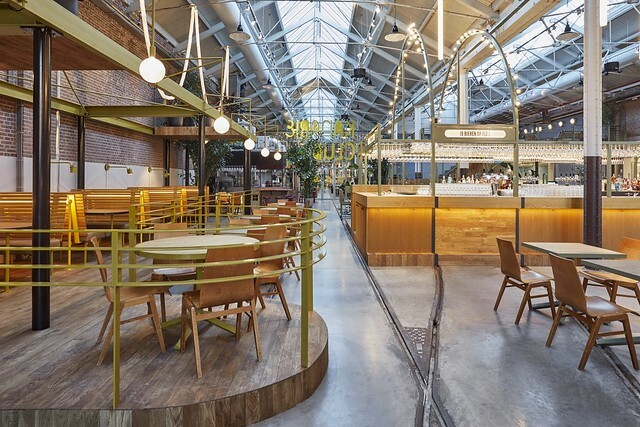 The tram rails have been respected in the new interior and celebrated in the design while creating strong strokes, climbing up the bar and forming an arch with integrated lights which frame it. 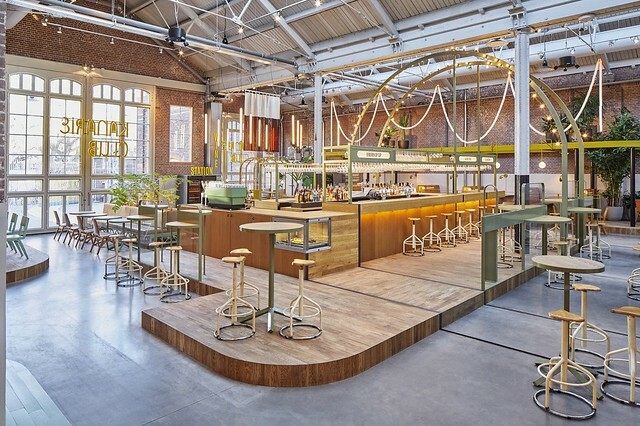 This great arch, formed by the rails, breaks the space and shines onto the bar, highlighting its presence. 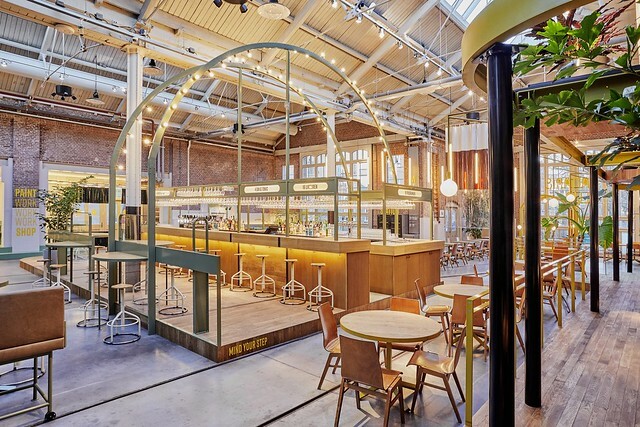 Sitting on a platform the bar is positioned centrally in the space to be visible from all parts of the interior and from the Food Hallen next door, while dividing the space and creating intimate zones in a vast space. A new staircase has been designed leading to the entresol area, which gives this space a stronger presence. The former staircase has been re positioned to create a grand entrance and emphasize the presence of the new Pool Bar, it styles this space as a striking part of the overall interior. 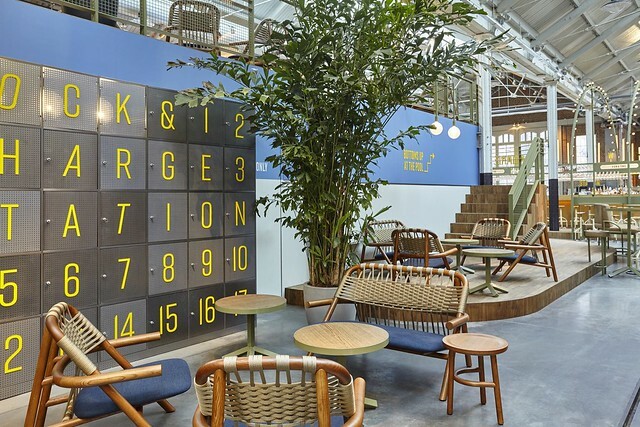 Tram signage and language has been used for the restaurant signing, while custom made furniture resembles the vintage design of the old electric tram seats. Positioned on the remaining tram rails, some seats stand on small wheels and seem as if they can slide down the rails any moment, giving the design a touch of playfulness. Custom made furniture creates motifs in the space. 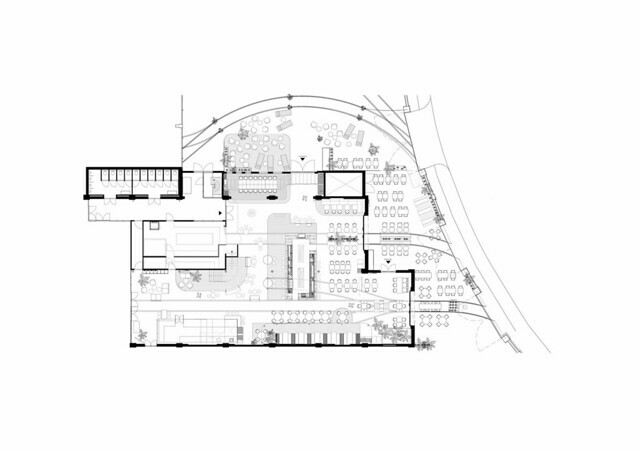 Aligned with the tram rails and other features of the building, enclaves are created within the space where one can have privacy while still being present in the larger space. 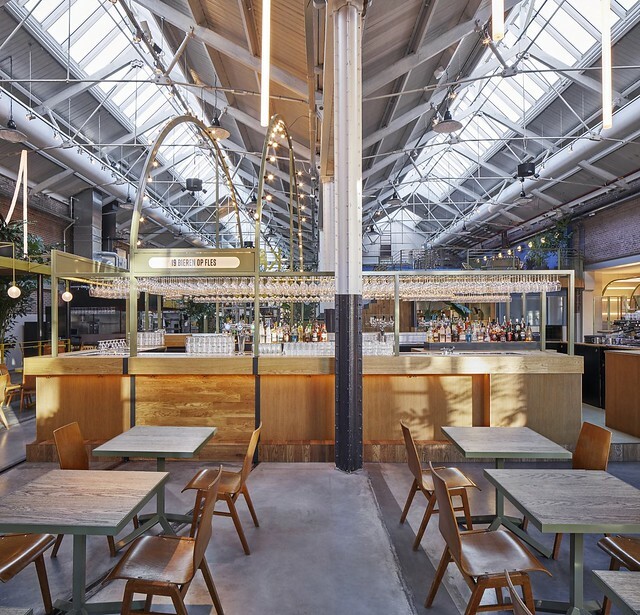 Combined with plant boxes and lighting, tailor made elements adorn the space and create a lively interior. 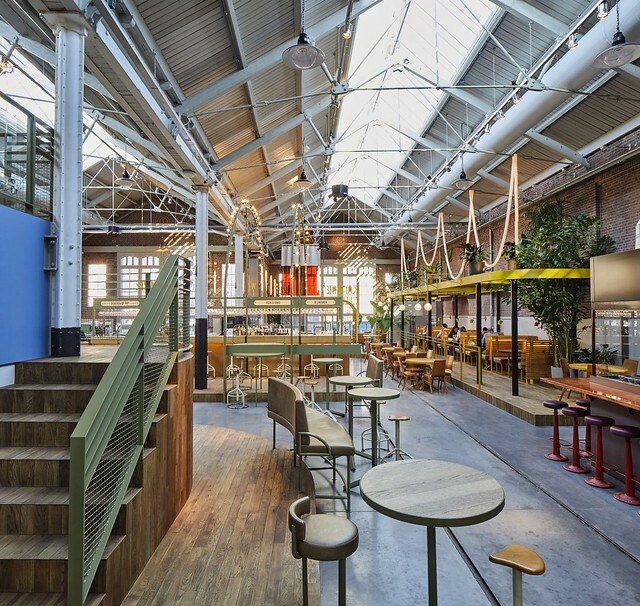 Industrial curtains with colored strokes, create a clear separation in the space and form the vestibule for those entering the restaurant from the terrace. 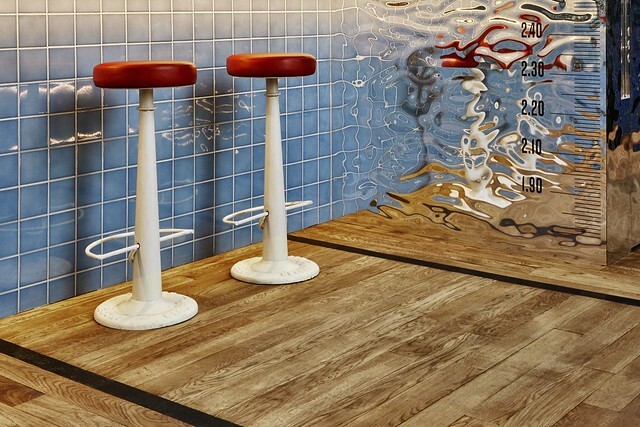 Several platforms have been created in order to divide and break the space and to make way for easy installation of fixed furniture to the floor. 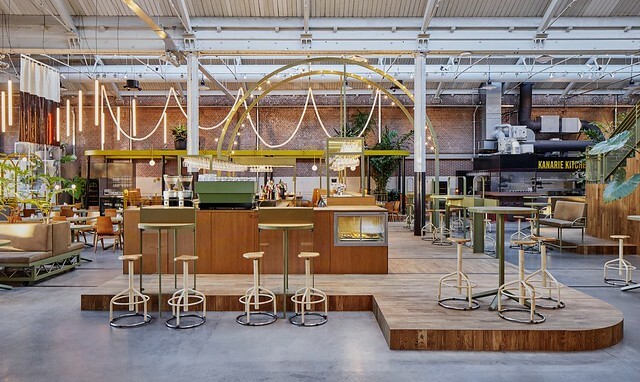 With a very high ceiling the space calls for division, a large string of lights hang from the ceiling while railings, light fixtures and large plant boxes form the space. 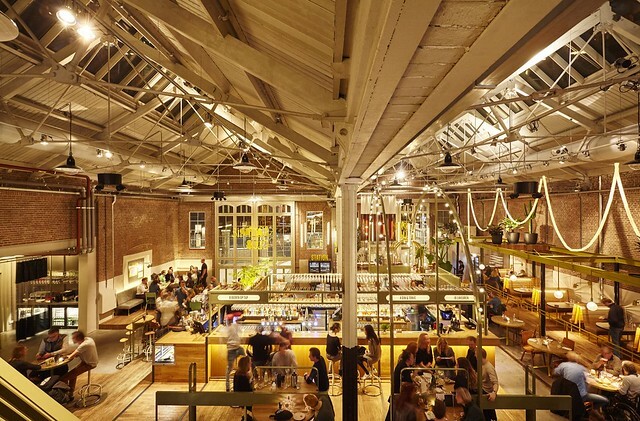 Extra-large signs in canary yellow hang in the space above both entrances; visible from the street and the Foodhallen, these signs hang above reaching height while their presence is strongly felt outside as much as inside. Designed to be a work place during the day as much as it is a restaurant and bar, special facilities have been thought of, including a charging point with lockers where you can lock up a phone or a laptop while it charges. A printer, to take care of all the admin work and a photo booth to add an element of fun to this all. A large group table with built in usb ports and plugs has been placed in the work zone for a pleasant workday at Kanarie Club. 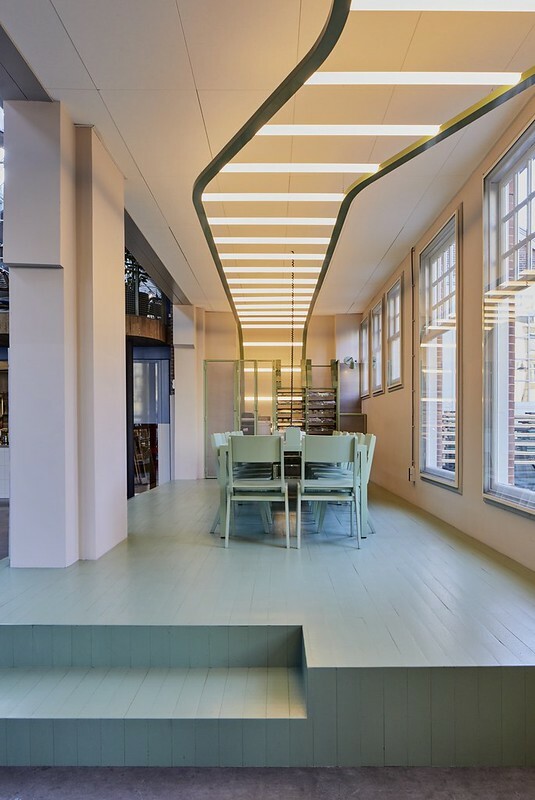 The form and repetition in tram rails has been used as a strong reference for the design of lights above the group table. 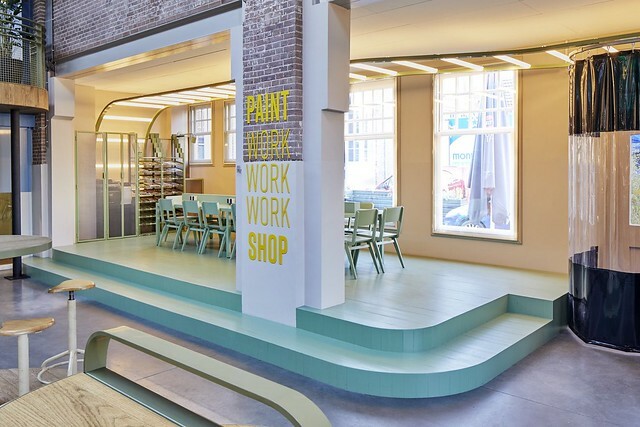 Inspired by paint workshops this space is completely covered in green and appears as a splash of light green paint in the space, while shouting work, work, work! 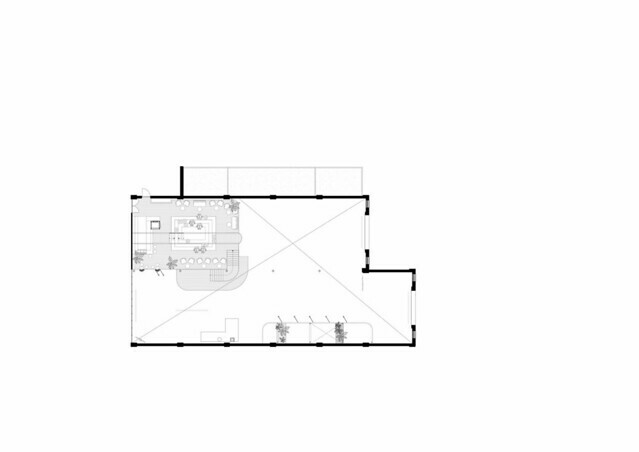 A split level is created above the kitchen to form an entresol with a lounge area called the Pool Bar. 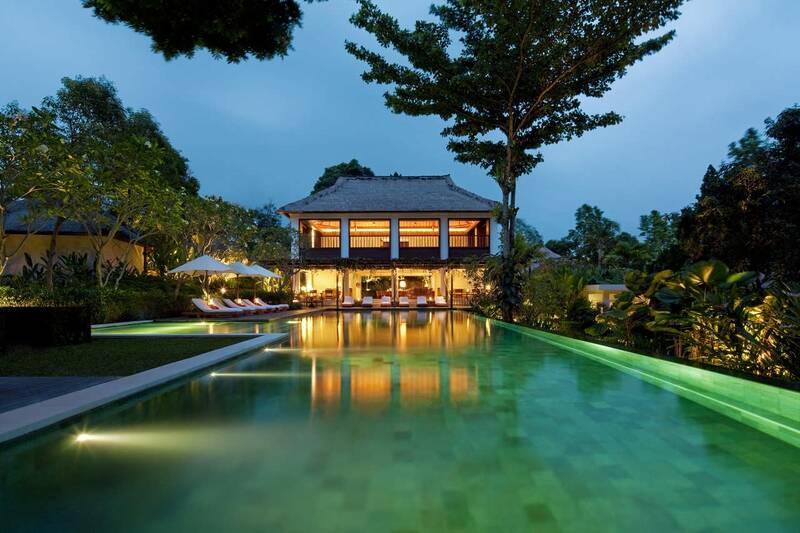 Looking over the Kanarie Club, there is a whole new world to discover. 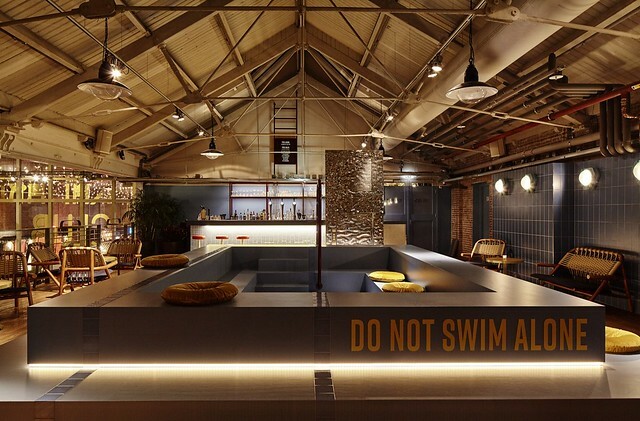 The concept is taken from the squatters who used to live in the old tram depot before its renovation, they used the leaking water from the ceiling to create an inside pool for themselves. The new pool however will not be filled with water. With round comfy cushions and a splash of blue everywhere, it’s the perfect place to unwind and enjoy a cocktail. 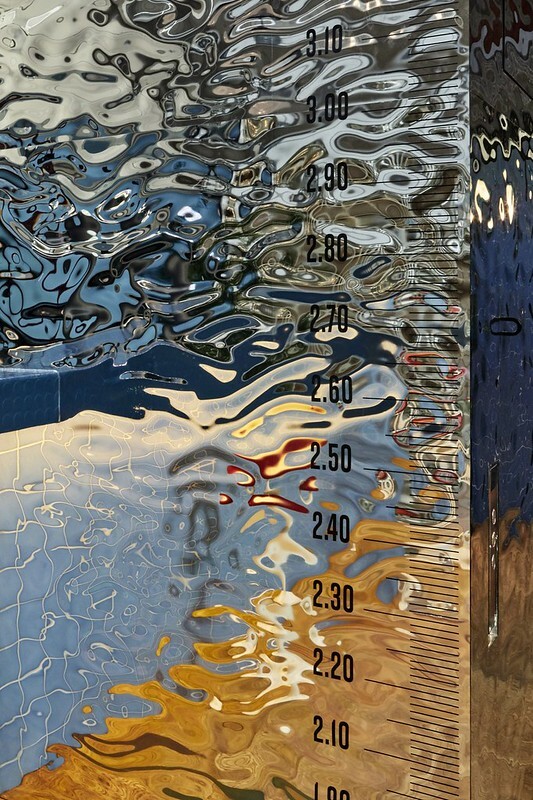 Made out of blue rubber with a stroke of matching tiles, the pool is complimented with a typical pool railing and a wavy mirror element on the bar lift. 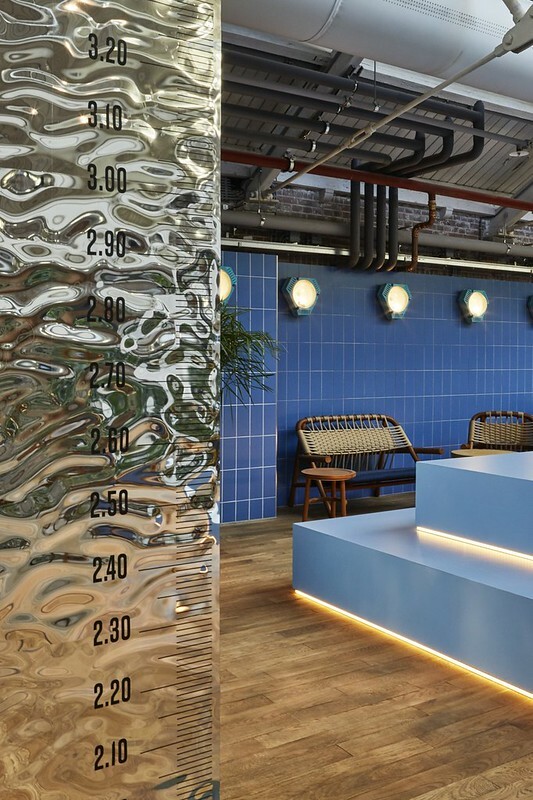 Pool signs and graphics with a direct reference to swimming pool rules have been used in the space to emphasize the identity of this part of the interior. Introduced by Studio Modijefsky, the name Kanarie Club is a friendly and playful name, it portrays a club that everyone can join and be part of. 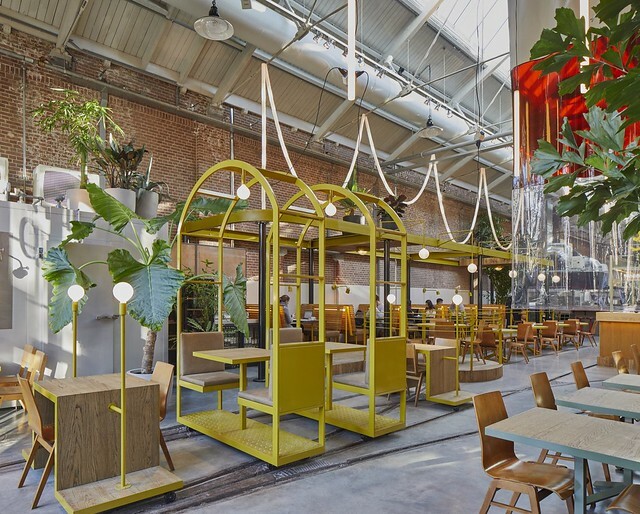 The contrast between a colorful little bird and the raw industrial space gives a special character to the new restaurant, a place to enjoy from dawn to dusk. Whether for work, a good meal with friends or a special event Kanarie Club is the place for it all.